MILAN – An exhibition in Milan is offering through the lens of 65 photographers an original look at the topic of immigration and the migrant crisis. The Restless Earth, organised by the Nicola Trussardi foundation, is being presented by the Visual Arts Program of Milan’s Triennale (www.triennale.org), the title alluding to works by Caribbean poet Edouard Glissant on how different cultures can live together. 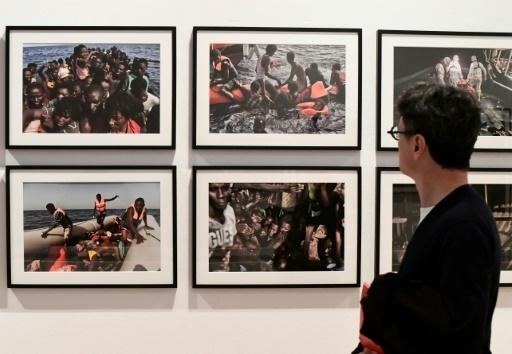 The exhibition with works from photographers from some 40 countries, including Syria and Turkey, is an "exercise in empathy, understanding, inter-cultural dialogue" to facilitate "a future together", Trussardi says. Their works are designed to show migrants’ experiences but also hint at perceptions of new arrivals amid the worst refugee crisis Europe has known since World War II. Italy has been in the front line of the crisis, receiving tens of thousands of migrants attempting the dangerous sea crossing from Libya in vessels that often are barely seaworthy. Included in the exhibition, which runs through August 20, are 26 powerful images taken by AFP photographer Aris Messinis depicting their hazardous journeys. Another powerful exhibit is Syrian Manaf Halbouni’s "Nowhere is Home," comprising a car crammed full of objects to symbolise the transient existence of refugees with nowhere to call their own. Also throwing into stark relief the human cost of the migrant crisis is an exhibit of passports, damaged mobile phones and other personal items from refugees who drowned off Lampedusa, an island near Sicily where hundreds of Africans drowned when their vessels capsized in 2013. Milan itself is an industrial economic hub in the north of Italy where the anti-immigrant Northern League has sought to extract political capital from the migrant crisis, a divisive issue across the country. In January, tensions boiled over as residents at a migrant reception centre near Venice set the facility ablaze after the death of a female refugee which residents blamed on a long delay in getting her medical treatment.